Mergermarket is pleased to present A blueprint for digitalisation, produced in association with Noerr and the Technical University of Munich. 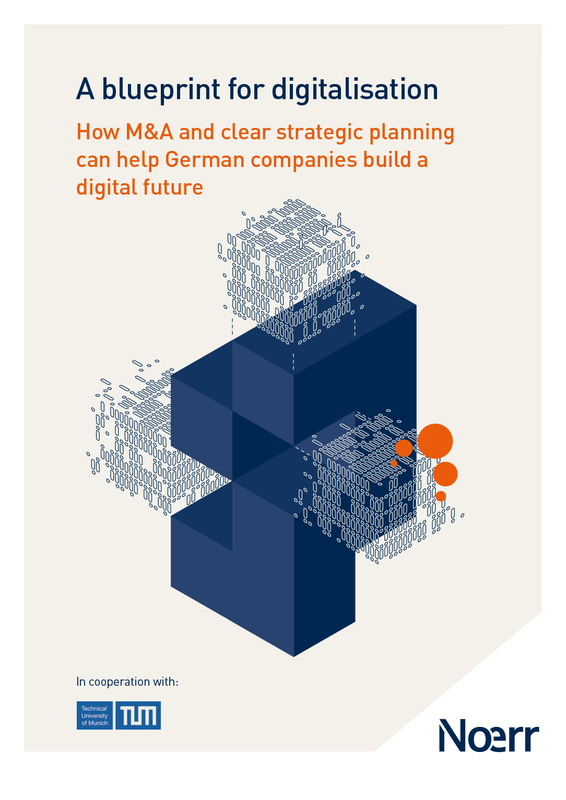 This report offers analysis of the German M&A market between 2013 and 2018 and an insight into how businesses can move towards a successful digitalisation strategy. 68% of businesses surveyed in this report say that digital transformation now plays a central role in their strategy. However, 45% do not have or do not know whether they have a clear digitalisation strategy. Acquisitions are the main way in which companies are enhancing their digital strategy, with 71% of respondents agreeing that acquiring digital firms now plays a central role in their strategy. The number of deals with a digitalisation element in Germany has risen significantly, from 19% to 25% from 2013-2017. Key success factors for digital M&A are the integration of the organisational structure, culture and management information systems of the target into the acquiring company, as well as keeping the employees of the target on board.